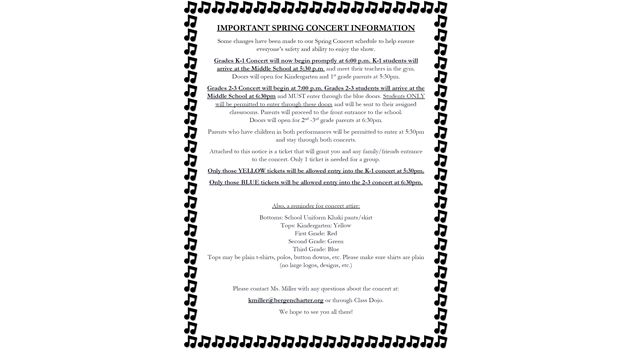 Some changes have been made to our Spring Concert schedule to help ensure everyone’s safety and ability to enjoy the show. 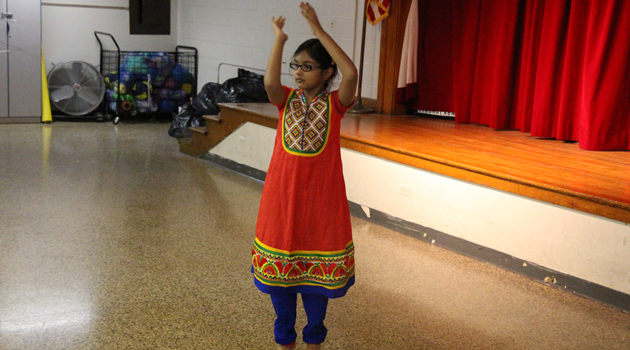 Grades K-1 Concert will now begin promptly at 6:00 p.m. K-1 students will arrive at the Middle School at 5:30 p.m. and meet their teachers in the gym. Doors will open for Kindergarten and 1st grade parents at 5:30pm. Grades 2-3 Concert will begin at 7:00 p.m. Grades 2-3 students will arrive at the Middle School at 6:30 pm and MUST enter through the blue doors. Students ONLY will be permitted to enter through these doors and will be sent to their assigned classrooms. Parents will proceed to the front entrance to the school. Doors will open for 2nd -3rd grade parents at 6:30pm. Parents who have children in both performances will be permitted to enter at 5:30 pm and stay through both concerts. Attached to this notice is a ticket that will grant you and any family/friends entrance to the concert. Only 1 ticket is needed for a group. Only those YELLOW tickets will be allowed entry into the K-1 concert at 5:30 pm. Only those BLUE tickets will be allowed entry into the 2-3 concert at 6:30 pm. kmiller@bergencharter.org or through Class Dojo.